The littlest super hero fans won’t mind getting ready for bed when they know they can say goodnight to Batman, Superman, Wonder Woman, and the rest of their favorite characters before drifting off to sleep. Super heroes’ days are action-packed. They race around the world, battle the baddest of bad guys, and outwit villains to keep people safe. They are also busy inventing gadgets and super hero suits and keeping the environment safe from harm—and some of them even have day jobs! But just like everyone else, after a long, hard day (of saving the world), Batman, Batgirl, Green Lantern, and The Flash head home to rest. Superman, Cyborg, and the others get ready for bed and curl up to get a good night’s sleep so they can be strong, smart, and powerful for another day. 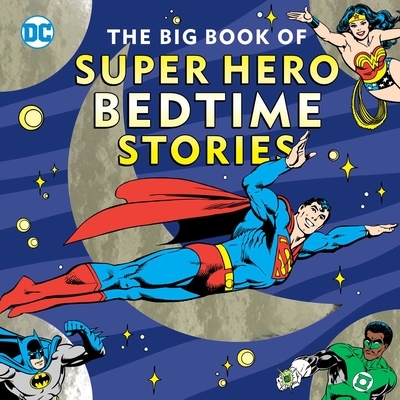 The Big Book of Bedtime Stories for Super Heroes provides a solid introduction to the DC Universe and is the perfect calming picture book for super heroes in training who need a good rest. Noah Smith is the author of The Big Book of Batman and The Big Book of Superman. He is also a contributing writer for The Official DC Super Hero Joke Book. A comedy writer and playwright, he has written material for “Weekend Update” on Saturday Night Live, and his plays have been produced in forty-four states and on four continents. The illustrations are in the DC Classic style and feature the work of beloved artists like Jose Luis Garcia-Lopez.